As our thoughts turn to the summer season, and holidays in the sunshine, why not add a splash of colour to your wardrobe with a pair of exquisite handmade earrings. These dainty chandelier earrings will make you feel like a true princess. This pair is made from delicate aquamarine briolettes combined with 22ct gold vermeil. 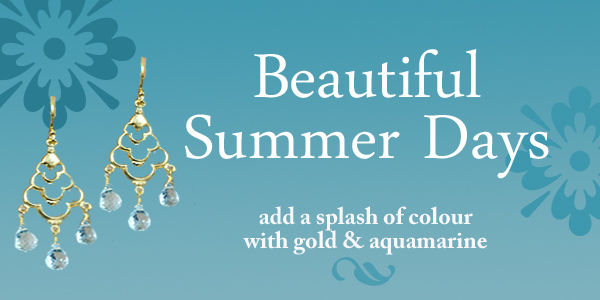 Aquamarine and gold, truly are a colour match made in heaven and look fabulous with navy, white and blue. This season is all about the 'Statement' earring so why not try out this trend for yourself. This pair is the perfect accessory for a summer wedding outfit, or to wear in the evening to update a favourite holiday dress.